This post gives an overview of rubber processing. 1/2 coconut shell is the commonly seen container used to catch the dripping latex from rubber trees. Because there are a lot of coconuts in Jambi, a ½ shell is almost always used to collect the latex. The shell is either placed on the ground or propped against the tree with a 3-5’ branch that has a “Y” on the end of it. 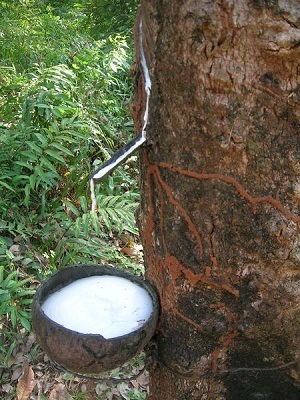 The trees are cut diagonally, which opens the bark and allows the latex to flow down and out onto a metal spout that has been inserted into the tree’s bark. From there the latex drips into the coconut shell. New cuts on trees usually take place during early morning hours. A good harvester can make a new cut in 20 seconds, and daily they can cut between 450-650 trees. This picture shows a rubber plantation with some younger trees. There is a home built in the center of it so workers don’t have to travel too far. The man in the picture is carrying a homemade gun. At that time he was hunting wild pigs and monkeys. A common sight in the Jambi Province is rubber plantations. 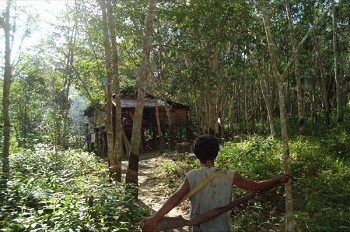 It’s also common to see people have their own private plot of rubber trees close to their homes. For outsiders, the sight of a tree that’s been tapped, and latex that’s in the process of being collected is very interesting. Locals are amused at the outsider’s curiosity with something that is so common to them.